How do we cope with baby colic? Everyone knows that newborns cry. A lot. Usually, feeding, changing, or rocking the baby helps to calm the fussing. But if a baby has colic, it’s not that simple. « Colic is when a baby cries intensely for three or more hours at a time, usually during the evening hours, on at least three days of the week, for longer than three weeks in a row — for no apparent reason, » says Mary Ann LoFrumento, M.D., author of Simply Parenting: Understanding Your Newborn &amp; Infant. Colic usually begins around week 2 or 3 of the baby’s life and peaks at around 6 to 8 weeks. Unlike with regular infant crying, attempts to stop colic-induced sob sessions by feeding, burping, rocking, or changing the diaper aren’t successful. If you think your baby has colic, check with her pediatrician to make sure there isn’t something else going on, such as reflux, a string of hair wrapped around Baby’s finger, or an illness. The good news: If it is colic, it’s short-lived, and your pediatrician can also help find ways to help the colic. Colic usually goes away by 2 or 3 months. Until then, these tips can help you maintain your sanity. So, when your baby is having a bout of crying, just take a deep breath and carry on with the basics. Feed her on demand, wind her and change his/her nappy when she/he needs it. Try the soothing techniques that usually work well for her, whether that be singing to her or taking her for a walk in the pushchair. Bear in mind that your tried-and-trusted techniques may not work every time. 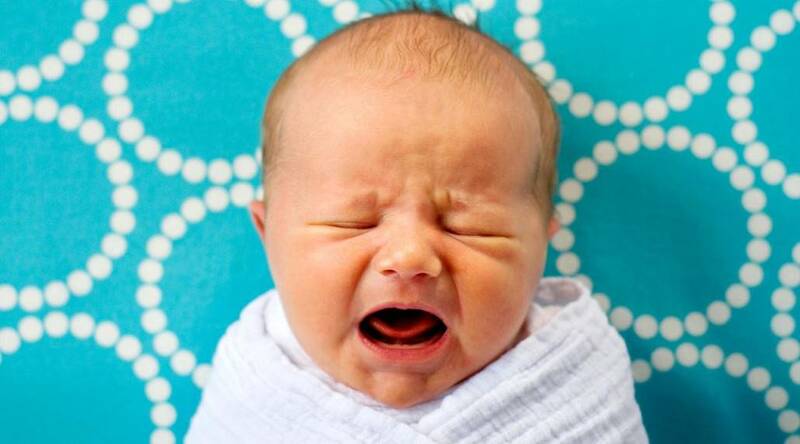 Colic means that, even though your baby is healthy, she/he may just cry for no obvious reason. While this can be stressful, remind yourself that you haven’t done anything wrong, and that this phase will pass. Dealing with colic can be tough, and some parents feel depressed, helpless and even angry when faced with their persistently crying baby. If the tension mounts to the point where your stress turns to anger, put your baby down in her cot for five minutes and go into a different room to calm yourself. The last thing you want to do is to direct that anger towards your baby. If you need to, set a timer so you know how long it’s been. Have a rest, or some « me time », while your baby is sleeping. Listen to a relaxation podcast. Enjoy your baby by making a note of the good times you have together. Talk to your partner about how you’re both coping and what you can do. If you’re struggling, it’s important to seek help before you become overwhelmed. If you become anxious, your baby may pick up on this, making her more difficult to soothe. Don’t be afraid to contact a doula if your need help!